Blogging is an invaluable tool for expressing ideas, archiving journeys, and engaging with others around topics you're passionate about. Here are 4 Ways Blogging Can Reshape Education. Humankind thrives off sharing. It's part of our genetic makeup and one of the driving forces behind all technological innovation, period. Even the Agricultural and Industrial revolutions could be said to have been built on the premise that a more streamlined process of production would allow more free time to, well, share. Stories, ideas, messages, the platforms have changed, but the message is the same. I want to share my story, and I want to hear yours too, even if it's what you had for breakfast. Technology allows us to share, and we want to share with as many people as we can. Sharing is important. We see how powerful the impact can be when we share something we are passionate about, something that inspires us, and the reaction albeit positive or negative when we share this out with the world. So what makes Social Media so powerful? It doesn't seem to be the media itself, as media is nothing new. It has existed in one form of another for thousands of years. Today, it is shoved in our faces by multimillion dollar mass media corporations that define what we should look, think, eat, listen to, say, and more. This it's why it's all about the social aspect. It's about the empowerment of individuals connecting to something bigger than themselves, and as big as the distance between them. George Couros summed it up beautifully when he challenged the limitation of citizenship in the digital age, flipping it on its head through the lens of leadership. Such an approach empowers anyone with a smartphone, and a positive message that can change the world. I left his talk at iPadpalooza a little dizzy because really, what he was focusing on was so simple. I think that's what made it so inspiring, that like many times with amazing ideas, it was "so obvious". When I reflect and my social experience on Twitter it's rather mind blowing. I'm Hasidic Orthodox Rabbi, who is stereotypically labeled as insular, closed off from the world, and one who typically fears or shuns the Internet and technology. Yet, here I am on social media interacting with individuals who I might never have a chance to connect with if not for social media. These people support, embrace and empower me and the culture I represent while giving me an opportunity to do the same for them. Social Media has a tremendous ability to build bridges, bulldoze predugice, and exposing ignorance for nothing more than a missunderstanding. Social Media is powerful. Now, like anything in this world nothing is perfect. There is much that exists on the thresholds of pricelessness, for the powerful and positive impact it makes, while simultaneously standing on the threshold of hate, prejudice, and disgust. This is my working definition for the Internet. There is plenty to criticize and much to be shielded from, and that's what being a citizen is all about. Citizens are protected, sustained and kept safe. They are not trusted, and require some entity to provide these services for them. This is why we must focus on creating digital leaders, who are aware of imperfections, yet looked beyond them to see how the tool, the platform, and the conversation can better themselves, better those around them, and better the world. Social Media is built on sharing and we must share in a moral, thoughtful, and productive way. There is lots of buzz around how, what, why, and when we share, and it is up to us as educators to help shape our students thinking, as they will grow up to become the next generation of technology innovators. Someone was the 3rd-grade teacher for a Facebook engineer, and another a 7th-grade teacher for a Twitter Executive. Social Media is giving us a momentous opportunity. Do not underestimate the power you have to believe in, and push your students to not just think out of the box, but to redefine the box. The Lubavitcher Rebbe famously said that the most minute amount of light can dispel a seemingly infinite amount of darkness. We must be that light, and show our students they can be lamplighters. Fast forward to the 21st century, and we see that technology has once again revolutionized our lives. Twenty years ago you graduated high school and did one of three things: go to college, learn a trade, or join the army. You then spent the next two decade or so in the same job, hoping that with time you would rise up the chain of command at the same company. Now we go to college and graduate in a discipline we will never utilize, and will have at least eight jobs before we turn forty. At least thats what the internet says. a voice, and the quest for connection. a tremendous amount of time for creativity, connection, and collaboration which sometimes leads to creatively connected collaboration. Five years ago an educator could connect online via a handful of education websites, blogs, and the occasional forum. Our connection was limited to website updates and their frequency, or isolated user generated forum postings. Even with the wealth of information on the internet, we were still limited. learn more from their PLN on Twitter than their entire Masters degree program. The connection is an open ended one. It's what you do with it. Sharing your projects, reaching out for help, or just absorbing the inspiration of #edchat can give anyone looking for a connection something meaningful. Hello World. My name is Michael Cohen. I am the Director of Technology for Harkham Hillel Hebrew Academy in Beverly Hills, Ca. This blog are my own thoughts, and HHHA does not endorse them in any way. Who am I? I am a Tech Rabbi- say what? I believe that technology is a tool to share knowledge with the world, including Torah, hence the Rabbi part. Besides that, I am a husband, a father, a son, an artist, a lover of skateboarding, hiking, and even know a little bit about fine wine and a good scotch. 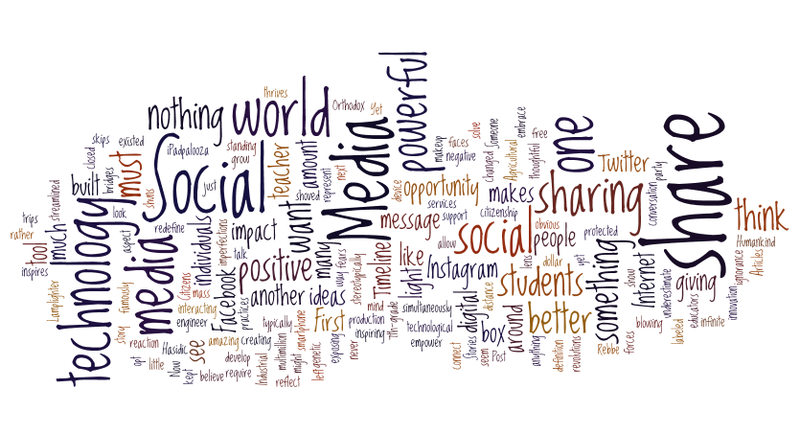 I envision this blog being a place to share my experiences as an educator, a student, and an individual who sees the tremendous value not in technology itself, but what it empowers individuals to be able to do. Technology has brought a wellspring of knowledge into the hands of anyone looking to learn. This means that instead of spending time memorize information, we can spend time internalizing information through innovation and creativity. I hope to share my thoughts on this via twitter in hopes to spark a conversation about how we learn together.